Nharangga people had been travelling to Wardang Island long before the arrival of Europeans. The island could be accessed at low tide by wading out to Green Island and then swimming for a kilometre or so across a deep channel. People would sit on the shore and sing songs and wave branches to distract the sharks from swimmers. The island’s reefs were rich in shellfish and fish and nesting birds provided both eggs and meat. When Europeans arrived on Yorke Peninsula, Wardang Island, like most of the peninsula, was taken from the Nharangga. The first lease was taken out on the island in 1861. Aboriginal people were allowed access, however, and continued to visit the island to hunt and fish and gather foods. The lease ran until 1877 when it was transferred to the Point Pearce Mission. The island was stocked with sheep and large water tanks were constructed, living quarters, shearing sheds and other facilities were built. 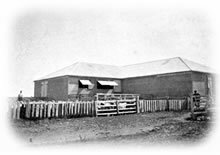 Several families stayed on the island to manage the stock and the children attended a small school. 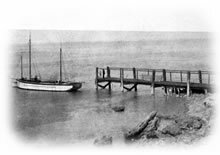 A barge was used to ferry materials and stock to and from the island and later a ketch, ‘the Nharangga’, would move between the island and Dolly’s jetty. BHP began to quarry lime sand on the island in 1910 and a number of Point Pearce men worked in the quarries or loading barges. In 1948 the Government abolished the Aboriginal Reserve and access was restricted. BHP continued operations until 1968 and after several years the lease was returned to the Point Pearce Mission.